I wasn't counting on the new Built to Spill album being so good. I was mildly disappointed with the last studio album and so I had sort of slept on the news of Untethered Moon dropping. But one listen to this record during my rainy commute to work today convinced me that the band, despite a shake-up of the line-up recently, has never sounded this fired up, to use a cliched term. Doug Martsch positively roars on opener "All Our Songs" and when he promises that "Rock and roll will be here forever", one certainly wants to believe him. He sings with a mixture of doubt and conviction that lends those hoary lyrics some real power. The guitar workouts on this cut are, as you may guess, ferocious and full of fire. "Living Zoo" is equally peppy and it serves as a real showcase for bassist Jason Albertini and drummer Steve Gere, while "On The Way" adds a twangy guitar hook to a loping beat to produce something close to the closest Martsch will ever get to a country tune. I say "country" only for lack of a better comparison to describe the cut whose lyrics give Untethered Moon its title. "With fewer people it's easier to focus and communicate during the songwriting process," says Martsch. "Also we wanted to make the record a little more stripped-down, a little rawer than our last one." I'd say they have succeeded admirably. 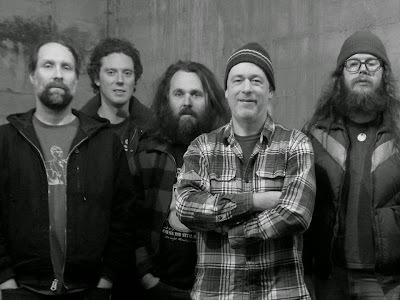 One listen to something like "Some Other Song" should convince you that there's no other band quite like Built to Spill, even in 2015. The strange mix of plaintiveness -- is that a word? -- and trippy exploration is a combination that produces moments of real power and beauty. Any Built to Spill record is guaranteed to have those "magical" moments, to again quote the press release for Untethered Moon. "Never Be The Same" is the obligatory near-catchy single that distills the appeal of Built to Spill into something accessible and closer to the mainstream than some of the other cuts on this record. But, still, that's not to make this sound like an out there album. If anything Untethered Moon is more accessible than 1997's Perfect From Now On but this is an album that takes just as many risks. It's just that now, in 2015, Martsch has found a way to produce music that remains expansive and accessible. No mean feat, that. The weird angles of the weirdly titled "C.R.E.B." give way to the straightforward guitar surges of "Another Day" which, oddly recalls for me some old Soundgarden hooks filtered through a sensibility closer to that found on early Dinosaur Jr. records. "Horizon to Cliff" is an achingly beautiful melody of the sort that only Martsch can pull off sometimes. Equal parts Neil Young vocals and Richard Thompson-worthy guitar hooks, the cut is a short one in this band's canon but it's a lovely tune all the same. "So" features some of the best guitar stuff on the record and that's saying something when you're talking about a Built to Spill album. Untethered Moon closes on the epic "When I'm Blind" which, unsurprisingly, showcases Martsch's skills on the axe. The whole "I got lost!" refrain oddly makes a listener think of some Mark E. Smith rant stretched far beyond its borders as a Fall tune. There's something wonderfully funky and abrasive about this final song and yet it still sounds like a Built to Spill classic. The 8 minutes of this cut fly by as we wait for Martsch and his crew to unleash fury on their guitars and things unfurl atop that constant rhythm section throb. A strange cousin to older Built to Spill cuts like "Time Trap", this one is a ferocious cut that features some of the best Martsch playing of the last decade plus. A marvelous and fitting end to a marvelous record. Follow Built to Spill on their official website. Untethered Moon is out now wherever music is sold online, or in your small corner of the world.